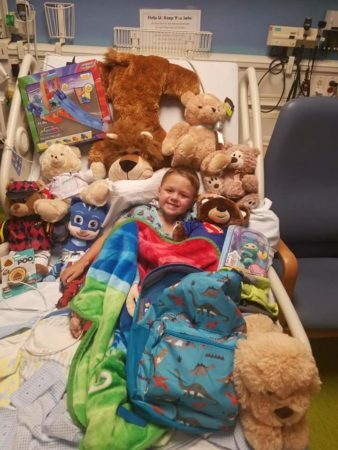 Rylan, 5, was a year and half old when he was officially diagnosed with idiopathic pancreatitis. July 2018 he had a total pancreatectomy with islet autotransplantation (TPIAT). Through his Mom, Haley Grammer, she shares Rylan’s journey with pancreatitis. From the time of birth to the diagnosis of pancreatitis Rylan cried ALL of the time as a baby. We were told he had acid reflux, but I honestly believe he was battling pain from pancreatitis. For the first year of his life, we sat in a rocking chair and rocked him nonstop while he cried. One day, my husband and I thought it was a just severe stomach virus. I slept with him on the couch due to his daddy having to work the next morning. Rylan would go from one end of the couch to another screaming. The next day, I took him to the doctor the next morning. The doctor didn’t know what it was and we left the office where, they placed a catheter bag on him, and we were told to leave and come back when he pottied. Well, a few hours later we went back with an empty bag. It was at that time, his pediatrician ordered an ultrasound and admitted him. The ultrasound came back abnormal, but they couldn’t really tell what was wrong. A CT scan was ordered next, and the radiologist said it was his appendix. We were transferred via ambulance to a children’s hospital that night. We weren’t told much, but they did say he would have emergency surgery when we arrived at the hospital two hours later. After arriving the doctors (thankfully) decided not to rush him back to surgery, and do some blood work first. After, bloodwork it showed that his lipase and amylase was off the charts high. He was hospitalized for a week with only IV fluids for the first 4 days. We were told it was caused from “mono” and he would never get it again. We ended up going back to the hospital and depending on how bad the attack was, we would be there for one night, but the majority of them lasted between 4-7 days. Life was a struggle. Rylan never felt good. He was always cranky, and his attitude was horrible. He had so much anger built up. I couldn’t even imagine what he was dealing with though. Pancreatitis also affected our other two boys (Rylan is the middle), Remington and Wyatt. Remi,8, is our oldest. He is Rylan’s biggest fan. He has prayed many nights that God would cure Rylan. His prayers were answered! When Rylan was first diagnosed with pancreatitis, Remi was only 4 years old. He really didn’t understand why we were gone with Rylan so much. I am so thankful that he learned to understand but also wanted to know more about Rylan’s condition. Majority of people wanted to learn about Rylan and his story. My parents and my husband’s mom were our biggest support system. We had family and friends that just couldn’t understand why we would ever consider putting Rylan through the things he went through. They thought we made Rylan’s condition worse than it really was for attention. Only parents of Chronic Pancreatitis kids will understand how hard it is. 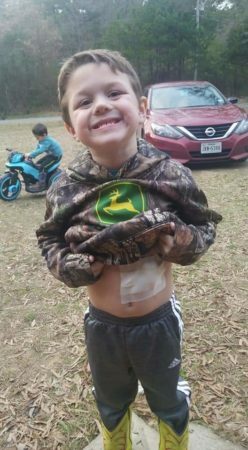 Rylan had his gallbladder removed on his 3rd birthday. He had been put to sleep at least 20 times, but that didn’t change the anxiety we dealt with. My husband and I took Rylan to Boston for a 2nd time to see a GI doctor there. I did a lot of research on the best pancreatic doctors in the U.S. and Boston Children’s was number 2. Our doctors in Texas didn’t know much about pancreatitis and honestly, they put Rylan on the back burner. We traveled to 3 different hospitals in Texas. Rylan’s GI in Dallas, TX was honest and told me she didn’t know enough to treat Rylan. Dr. Amit Grover at Boston Children’s was AMAZING to us! He cared about Rylan. He still keeps in touch for updates. We love him! 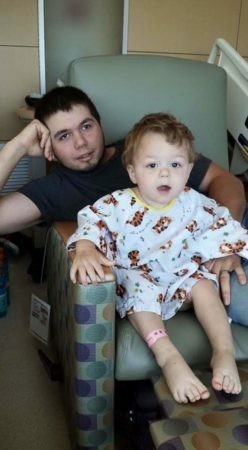 At that visit in March of 2018 he told us there was nothing else that could be done for Rylan by him and referred us to Cincinnati Children’s Hospital. We met with a team of doctors there in May. They placed a stent during an ERCP to see if that would stop the attacks. In June we returned to Cincinnati. Rylan had a few attacks even with the stent in place. They removed the stent and approved him for the TPIAT. The moment we were told it is the best thing for him, is a time we will never forget. Our life had revolved around pancreatitis and hospital visits. Vacations never happened because we were afraid of getting too far from his pediatrician. From 2015-2018 he was hospitalized around 22 times. We were happy to hear to hear that he was a candidate for TPIAT, heartbroken that it had come to that, but ready for a better life for our sweet boy. Rylan was 4 when we started talking about the TPIAT. We told him that the doctors were going to remove his pancreas to help cure his pain. He honestly didn’t have many questions. One thing he said was, “Momma and Daddy I sure hope these doctors fix my tummy.” We didn’t give him many details. We didn’t want him to have anxiety to the big day. My husband and I read stories, talked to other parents, and Dr. Jaimie Nathan and Dr. Tom Lin told us what to expect. 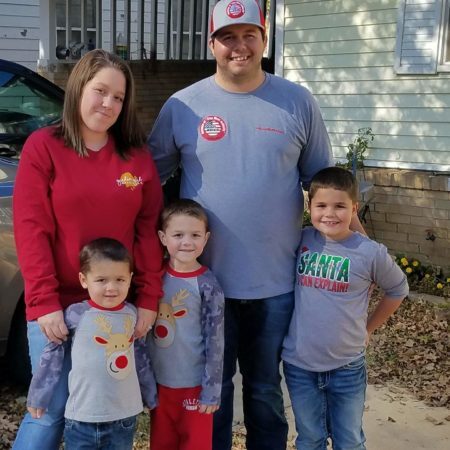 We didn’t want to tell Rylan that he’d be asleep for over 12 hours, that he’d come out on a breathing tube, or that the pain would be unbearable. He just knew that this was the start of a brand new life! He doesn’t remember the surgery, nor the pain during recovery. That’s a huge blessing. I’m not going to sugar coat it. The first week in ICU was SO bad! Rylan’s surgery started at 7:00am and we were finally able to see him at 1:30 the following morning. That is a total of 17 hours without seeing his sweet little face. He was on a ventilator for about 24 hours. It was seriously the hardest thing ever. The next week consisted of him trying to walk, getting his blood sugar under control, and of course controlling his pain. He had a pain pump for his stay in ICU. He was then sent to the Diabetes floor where his Daddy and I had to learn how to take care of him. We took diabetes classes every day, and had to be completely comfortable with him before we could leave the hospital. It is overwhelming and sometimes felt like we made the worst mistake. I can promise you that Rylan’s TPIAT was the best decision we ever made. It is far from hard, and you will feel like you are in a dark tunnel that is never-ending, but there is a light at the end! Rylan 6-months post-TPIAT shows his removed tubes! Not only does pancreatitis take a toll on you emotionally, but also financially too. It is expensive and tiring. I spent many nights laying in a hospital bed begging and praying. For other parents that are going through this – don’t let this consume you. I know it’s hard, but don’t sit around and dwell on it. Research! Research! Research! I made a promise to Rylan that we would never stop fighting for an answer for him and I meant it. If you don’t like a doctor find a new one. If you feel like you aren’t getting the answers you want research a different hospital. And as crazy as it seems, keeping your mind busy really does help. I always noticed that if Rylan stayed busy he wouldn’t hurt as bad. As soon as bedtime set in, he would cry of stomach pain and really never slept. It gave his mind time to relax and think about what his body was going through. Also, find a support group. There ARE other parents going through the same thing. I know it feels like you are alone, but I promise you aren’t. My husband and I have heard it all. From putting our kids on the back burner, to overreacting on Rylan’s condition, to even people disagreeing with us. I just want to say to never let anyone make you feel that way. You know your child better than anyone else in the world. I don’t care if it’s a grandparent, 3rd cousin, doctor, friend. No one knows your child better than YOU! You are going to be their biggest advocate always. Never stop fighting! Lean on your support system. Don’t do this alone. My parents, grandmother, my husband’s mom, and my husband’s granny were always there for us. If didn’t matter if it was helping us with our other boys, financially, or anything else we may need. My husband’s granny passed in February of last year, and oh how great it would be for her to see Rylan healed from pain! 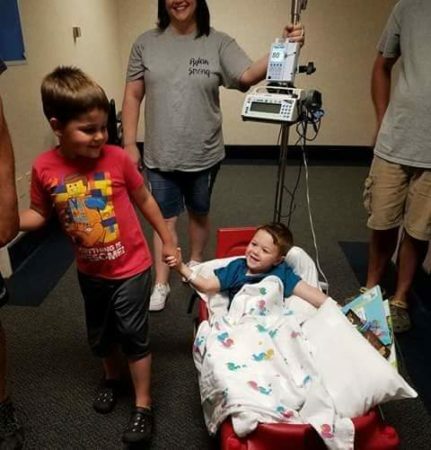 My parents and sister kept our other two boys during every hospital stay, and for the five weeks that we were in Cincinnati for the TPIAT. My mother-in-law stayed with us in Cincinnati for 2 weeks. Without them we couldn’t have done it. We are forever thankful! Rylan’s siblings will help us as well. Remi will check Rylan’s blood sugar in the mornings while I am getting our youngest ready for school, or cooking dinner. 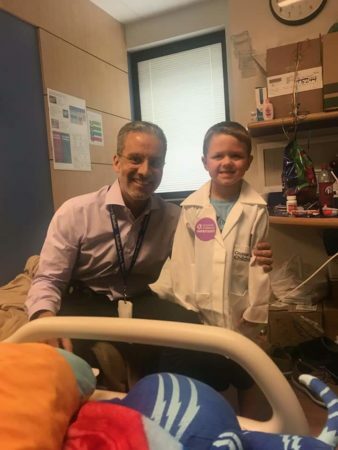 The whole Grammer family will forever be thankful for Rylan’s pediatrician, Dr. Grover from Boston Children’s Hospital, Dr. Nathan (Rylan’s surgeon), Dr. Lin his GI, Dr. Deborah Elder with the Diabetes team and everyone else that helped take care of our boy in Cincinnati. I found the NPF by researching pancreatitis and came across the page on Facebook. I’m so glad I did as it let me know my family and I were not alone in this journey. Today Rylan is a completely different kid. He never ate before, and now he eats ALL of the time! He never complains of stomach pain, and when he smiles he lights up the room. It is no longer a fake smile. He was completely off insulin after 6 months post TPIAT. His feeding tube has been removed, and he is going to school for 4 hours a day now. He tells us all of the time he is thankful he no longer has a pancreas. Now how crazy is that coming from a 5-year-old? Life is GOOD!